It’s funny how the memory works (or in my case, doesn’t). I’ve been making the Morning Glory for at least five years now, and it wasn’t until quite recently that I discovered that I’d been making it incorrectly this entire time. I’ve been telling every patron who would listen that this fantastic drink had a history dating all the way back to 1862 (when further examination occurred, I discovered it was actually 1887) and constructing it with Champagne instead of seltzer. And I call myself a professional (even if some of you don’t)! So, as I actually use my own site as a reference from time to time, I’d thought that I’d write a post about this lovely libation, in hopes that I’ll stop doling out incorrect information and cocktails (although I have a feeling that it’ll take a lot more than one post to correct my failing memory). The obvious way to get on with this, would be to cover the Morning Glory as first laid out by Jerry Thomas in 1887 and as copied from my Bon Vivant’s Companion, 1928 First Edition, #22 of 160.
a little sugar on it. As you can see, I’ve twisted the recipe around a bit, most notably upping the orange liqueur, reducing the syrup, adding bitters (they truly do make everything better) and, of course subbing the bubbly for the soda water. This is a really complex drink with a lot of brown spirit that still manages to pass trippingly over the tongue. While it is the perfect cocktail for this time of year, I don’t find it unimaginable to be quaffing this libation in the hotter months as well. The perceptive ones out there will quickly realize that the only difference between the Royale and the Aurora is the swap of St. Germain for the orange liqueur. While perhaps a subtle change, this little substitution makes a big difference in the cocktail and is a perfect example of how versatile St. Germain really is: I’ve yet to find a cocktail where the sub of St. Germain for orange liqueur or maraschino hasn’t worked. (Full disclosure: I am now Seattle’s St. Germain Ambassador, but if you look at the dates of earlier posts, you can see that I’ve been a big fan of this spirit since its initial release). That said, I find this variation to be my favorite of the three (and not just because it’s my creation). 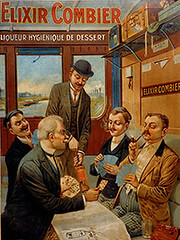 Combier Liqueur d’Orange is prepared in the distillery’s inner room surrounded by the age and warmth of century old copper stills and the intoxicating scent of fruits and berries from the surrounding Loire Valley. It is here where the magic begins. In line with Combier family tradition, the Master Distiller carefully marries the fragrant orange peels with sugar beets delivered straight from the fields of Normandy along with pure alcohol from outside of Paris. From there the Master Distiller uses a triple-distillation process- hence the term ‘triple-sec’- whereby the ingredients are three times distilled in the very same century-old copper stills first used by the Combier family. The copper and age of the stills add depth, while the triple-distillation process ensures that only the most pure and aromatic liqueur makes it into each bottle. Hence its crystal clear color. Each bottle of Combier is produced, packaged, and shipped from the same location since the 19th century. But what does it taste like? Like Cointreau, this spirit is bottled at 40 % ABV, but I find that it has a bit more of the bitter orange component than Cointreau has, which helps belie the inherent sweetness of the liqueur. As compared to Cointreau, Combier is definitely more assertive both in flavour profile as well as perceived heat. While I would prefer sipping Cointreau neat, Combier’s assertiveness lends itself very well to cocktail construction, and I would have no issue swapping one spirit out for the other, which I think is high praise, given my high regard for Cointreau. I’ve run out of things to say (or rather, time to say them), so I’ll wrap this up until next time: if I can only remember what the hell the theme of this post was…. Liqueurs? Jerry Thomas? 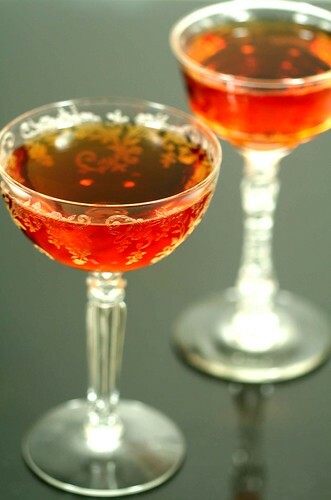 Oh yeah, the Morning Glory a drink invented in 1862 containing cognac, whiskey, absinthe, curaçao, and Champagne. Thank God for the web. ~ by Jamie Boudreau on February 16, 2009. I’m wondering: what do you think about Grand Marnier, compared to Cointreau and Combier Orange liqueur? I’m confused (it’s normal): At the beginning you say that the drink was “laid out” by Jerry Thomas in 1887. At the end, you say it was invented in 1862. If that’s true, where is the reference and why wouldn’t it have been in the first edition of the book? Or was it? G.M. is an entirely different beast. I’m much more partial to Cointreau as a standard, but one is very able to make good G.M. cocktails. The last paragraph was meant to poke fun at my memory. Not only did I get the date wrong, but also the ingredients. That’s why I ended with “Thank God for the web”. I thought that might be the case, but I’m a little dense, so I wasn’t sure. Now I can rest easy, my cognitive dissonance having been relieved. Thank you kind sir. In Only 3� Minutes, You Can Quickly And Easily Crank Out A Killer Cover Letter That Is Guaranteed To Have Your Phone Ringing Off The Hook With Hot Job Interviews And Top Job Offers… Without Writing One Word! I love the use of St. Germain in this cocktail. It really is one of the most versatile and delectable liqueurs in mixing. Jamie, have you ever tasted Combier’s Royal Combier? It’s apparently similar to Grand Marnier. Ive been reading a bit about it but do not believe that it is available in the US. thanks. I have not tried it, I’m afraid. Is this for real? They’re macerating sugar beets? Or some sort of marketing bull? I was recently in the Loire Valley, France and had a chance to visit the Combier distillery. To my delight, the family gave me a tour which included viewing first hand a distillation of their original triple sec (in 1800 copper stills designed by Gustave Eiffel!). It was quite a treat and needless to say I’ve become a huge fan! thanks Jamie for the air time. I’ve been trying out the Morning Glory Cocktail myself, but have noticed it’s a bit watery for my taste. Before I grab champagne and try out the M.G.R. and Aurora, is it safe to say I should stir less than I normally would before adding the bubbly to retain more of the taste of the spirits?